The St Vincent de Paul Society ("SVP") is an international Roman Catholic voluntary organization formed in the name of Saint Vincent de Paul and dedicated to tackling poverty and disadvantage by providing direct practical assistance to anyone in need. This society has been active in England & Wales since 1844; today it continues to address social and material need in all its many forms. The Society of St. Vincent de Paul was founded in 1833 to serve impoverished people living in the slums of Paris, France. The Society chose St Vincent de Paul. (24 April 1581 – 27 September 1660) as their Patron Saint. Vincent was a priest of the Catholic Church dedicated to serving the poor. He is venerated as a saint in the Catholic Church and the Anglican Communion. He was canonised in 1737. The primary figure behind the society's founding was Blessed Frederic Ozanam, a French lawyer, author, and professor in the Sorbonne. When he was 20 years old the society was founded, and was beatified by Pope John Paul II in 1997. The Parish President at Our Lady’s is Brother Frank Crawford and our Conference has eight members who meet at 8.00 pm every Tuesday. New members are always welcome. 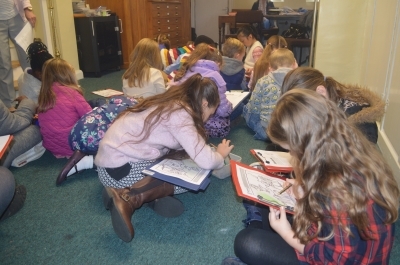 Catholic women join The UCM for a variety of reasons as meetings provide fellowship and friendship and are a blend of social and spiritual activities The UCM meeting, literature and contacts provide ongoing fresh interests. There are opportunities for varied and valuable Catholic action but nothing should be undertaken at the expense of personal family life. Through unity with other members, many thousands strong, greater influence can be exerted on public affairs that affect marriage and family life. United in prayer, members never face life's difficulties alone but are strengthened by the support of fellow members. There is a branch of the Union of Catholic Mothers at both Corpus Christi and Our Lady’s; both groups meet regularly. Mrs. Mary Tunley is the President at Corpus Christi, and Mrs Bernadette Kent is the President at Our Lady’s, and may be contacted c/o the parish. The Parish choir meets and rehearses under the direction of Mr. Russell Blanchette, and sings at the Saturday 5 p.m. anticipatory Mass for Sunday most weeks. For further information contact Russell. Our Folk Choir has got approximately 12 members as singers or instrumentalists, under the direction of Mrs. Christine Cleary, and sing at the 5 p.m. Saturday anticipatory Mass for Sunday approximately once each month; for further information, please contact Christine. Our Choir is under the direction of Mr Tony Whitehurst. The Choir sings at the Sunday Masses on the 2nd,4th and 5th Sunday of the month. New members are always welcome and should contact Tony. Our Folk Choir has got approximately 12 members as singers or instrumentalists. They meet for rehearsals on Friday evenings from 7.30 pm and sing at the first Sunday of the month Sunday Mass. New singers or instrumentalists are always welcome, and may make contact with Mary Vickers. 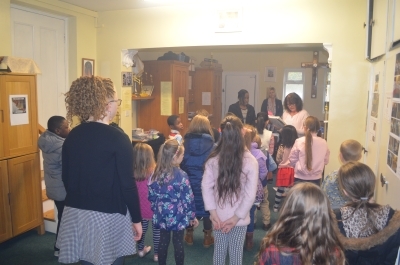 Once young children within the parishes have received their first Holy Communion, the parish priest may invite them to become an Altar Server. If the invitation is accepted, the individual then goes through some training with the parish priest and/ or an experienced server. 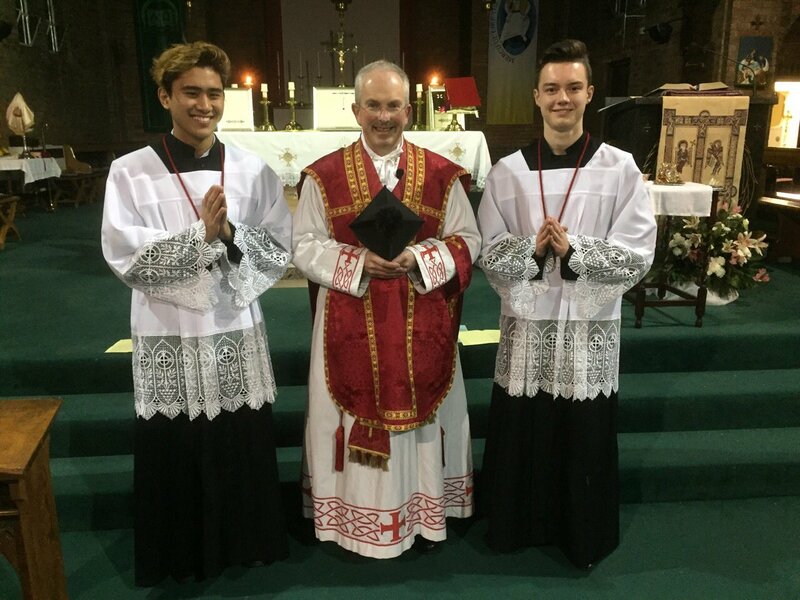 Currently, there are 3 MCs within the parishes; Joe Sweeney (Corpus Christi), Serjie Cruzada and Ciaran Barker (Our Lady’s). Altar servers play a most significant role in the celebration of the Church’s Liturgy particularly at Sunday Mass, and at significant times in the Church’s year including Christmas, Holy Week and Easter, and also during the parish annual Novena to Our Lady of Perpetual Succour. It is important that all Altar servers should try to grow in personal holiness in their private prayer, as well as in the liturgical and Sacramental life of the Church. 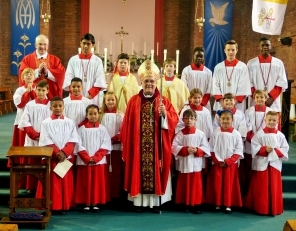 When a server has shown him/her-self to be committed and competent over a period of one or two years, the Parish Priest gives consideration to admitting the server to the Guild of St. Stephen for Altar Servers. 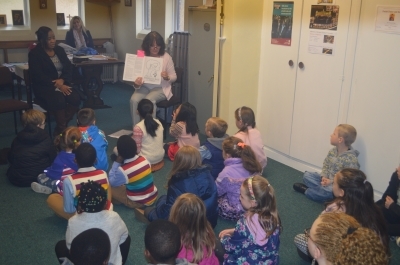 The children focus upon the Gospel of the day, at an age appopriate level. This is usually followed by an activity to reinforce the Gospel message. The children rejoin the full community at the offertory of the Mass.